Scott asks: What’s the difference between hares and rabbits? Is it just two names for the same thing? Rabbits and hares are often confused for one another, so much so that to many the two names are interchangeable in casual conversation. 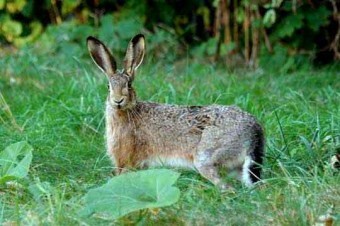 When you learn that jackrabbits are actually a type of hare, and that there’s a breed of rabbit called the Belgian hare, it’s not difficult to see how this can be confusing. However, rabbits and hares are quite different, so much so that they don’t breed with one another in their natural habitats. From the moment they are born, rabbits and hares are easily distinguished. 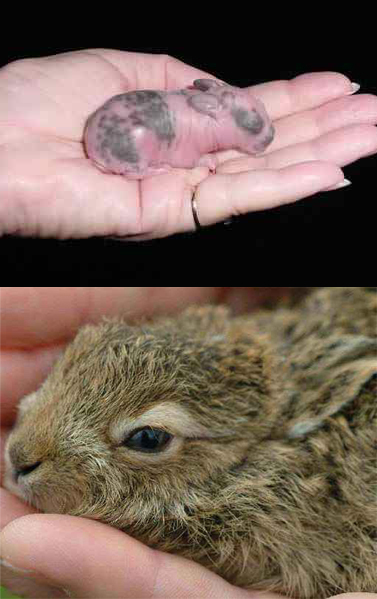 Baby rabbits, called kittens, are born blind and furless. They are unable to move around much on their own as they are as weak as, well, a newborn kitten. Baby hares, called leverets, have the upper hand. They are born with their fur and their eyes open. You might see a baby hare bouncing around and adorably exploring its new world shortly after birth. As they grow up, other physical differences begin to emerge, though it might be difficult for the casual observer to pinpoint those differences. Here are some tips. Hares are generally larger and have a “rangy” look to them—they are lithe and wiry, and have larger back legs and paws. Their ears are also longer, and stick straight up from the head. Usually, a hare’s ears will have black markings. Additionally, hares usually change colour according to season; they are grayish brown in spring, summer, and fall, and turn white in the winter. If you’re able to get close enough to these speedy creatures, you might also notice that a hare’s skull is slightly different in shape to a rabbit’s skull. In comparison, rabbits are generally smaller and look squat and chubby. Their back legs aren’t as prominent, and their ears are slightly shorter and tend to be slanted a little toward their backs. Their fur (usually) remains the same colour all year round. Of course, it isn’t all about appearances. Behaviourally, rabbits and hares are different as well. Rabbits are more social, and when they’re in the wild they prefer to share their burrows with other members of their rabbit colony. They sleep in their burrows during the day, hiding from potential predators. If Mother Rabbit has to leave her kittens, she’ll cover them up with lots of fur and leaves to keep them warm and safe. Each group also tends to have a dominant male that gets to mate with the majority of the local females. Hares, on the other hand, prefer to live alone, coming together only to mate (with little contention among males over mating rights), and usually make their homes in nests among tall grasses rather than dig a burrow. They also aren’t afraid to leave their leverets just hours after the babies are born. Baby hares are well equipped to living without their mothers at just an hour old. Their diet preferences are also different—though of course, where food is scarce, they’d likely eat what they could find. 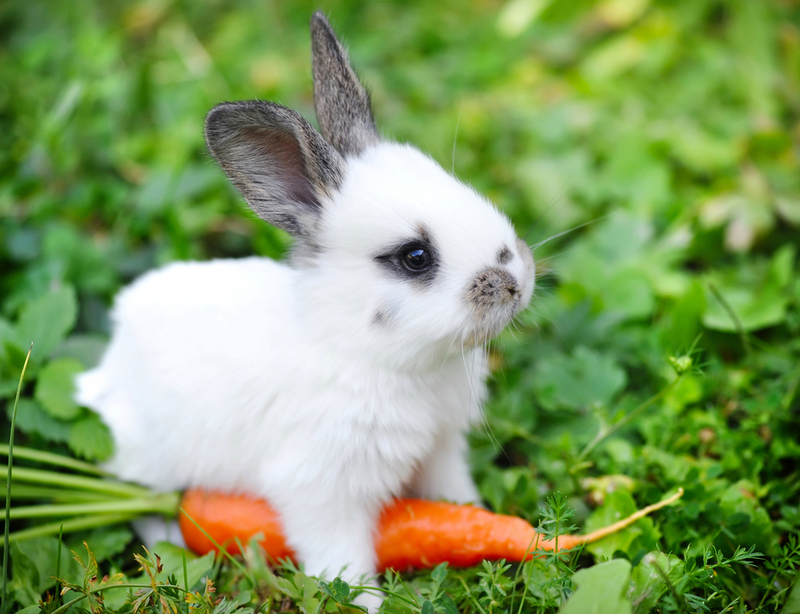 Rabbits prefer softer foods like grass and vegetables, while hares are more likely to choose harder foods like bark and twigs. For people looking into getting a rabbit as a pet, perhaps the most important difference is that rabbits have been domesticated while hares have not. So, if you walk into a pet shop looking for a hare, you’re not going to find one. That said, rabbits are still hopping around fields enjoying their freedom as well, so if you see a long-eared creature bouncing around in your backyard, you’ll have to use the visual clues listed above to determine if it’s a rabbit or a hare. During spring, you may observe hares appearing to box one another. This was once thought to be males competing for females, but it is known now that most such instances are between male and female hares, with the female trying to fight off the male when she isn’t interested in mating with him. The Hare in the story Tortoise and the Hare was aptly chosen. Hares are known to be quicker than rabbits. Since they live on the open ground rather than in burrows, hares had to become fast so that they could get away from their enemies. For reference, the North American jackrabbit can reach top speeds of up to 40 mph (17.88 meters/sec!!! ), faster even than gray wolves. Rabbits often sleep with their eyes open as a means of defense. If their brain registers movement within their visual range, they will wake up. If Peter Rabbit actually is a cottontail as his name suggests, then he really is a rabbit. However, the cottontail rabbit is even more easily confused with hares than other types. Cottontails usually live above ground in nests, just like hares do, rather than burrows. Cottontails are named that because of their short, stubby tails which are white on the underside. When they bound away from a predator, it looks like they have little pieces of white cotton on their bottoms. 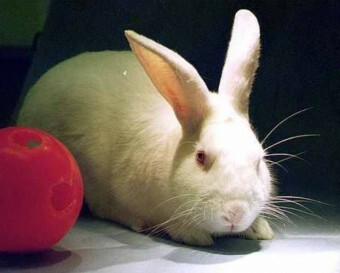 For an added bit of trivia, “bunnies” are not a different species at all, but just a pet name for rabbits, usually. That said, the Easter Bunny is most likely a hare—at least traditionally. The Easter Bunny started with a goddess named Eostre, who was linked to hares and fertility. Hares and rabbits are usually representatives of fertility due to their short gestation periods. Around the 1600s, the Germans invented a bunny figure called Oschter Haws, who left colourful eggs in nests that children had made in baskets. Rabbits and hares are found on every continent except Antarctica. Originally, Australia didn’t have any native rabbits or hares. These were brought over by European settlers in the 1800s and have since caused a lot of problems. They bred like… well… rabbits, but had no natural predators in Australia, so they became overpopulated. With that many bunnies hopping around, the habitats of native animals were damaged and many crops were ruined. Can You Distinguish a Rabbit from a Hare? So, from bonus facts, I gather that a Jackrabbit is actually a hare? Or, you know, the first paragraph….. The Arctic Hare is known to consume meat, and some have been observed biting a piece of flesh off of another living mammal, hopping away, eat the piece they took ‘to-go’, then doing the same again. Some hares can become opportunistic omnivores if preferred plant-based food is lacking, and can consume a substantial amount of their diet from insects (and sometimes even carcasses.) In the case of the Arctic Hare, bringing The Holy Grail to life should not come as that big of a surprise. Hares have extreme evolutionary developments centered around survival, and arctic mammals have extreme adaptations to survive in such harsh environments. Put those two things together and the Monty Python turns out to be real. just addition to these, we call baby animals that are born hairless, with closed eyes and helpless in short altricial, examples of these are of course rabbbits, dogs, cats, man. and its counter part, new born animals that can already fend for themselves without the help of their parents are precocial, examples of this are hares, horses, cattles, ducks etc.